As the Number 3 train rolled into Rouen Station, I struggled to pull my suitcases from the chrome rack at the end of the railcar. I had boarded in Paris, about 20 stops ago. Since then, other passengers had piled their bags on top of mine, burying them beneath layers of backpacks, assorted sizes and colors of luggage, and a bicycle. I steadied myself when the train came to a stop, still tugging to retrieve the biggest of my three bags. 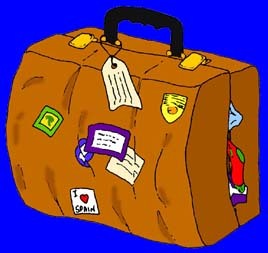 This was my favorite suitcase; my old standby. It had accompanied me on countless trips; however, what I forgot to take into account when packing for France was that I had used it on cruises, car trips, and vacations when my husband or porters did the lifting. Now, its immense capacity and monumental heaviness had become a problem. Even empty, the 30” high monstrosity weighed more than my traveling companion’s new, lightweight bag, when it was filled to capacity. Lou’s baggage was deeper and several inches shorter. And yet, it seemed to hold twice as much as my old navy blue, canvas suitcase. Reminding me of Mary Poppins’ bottomless carpetbag, Lou would reach inside and extract outfit after outfit; a never-ending supply, it seemed. She had purchased one of those expensive brands of luggage weighing ounces instead of tons. We had been in France for two weeks, moving from city to city by train. Most of the time, there weren’t any porters to lift my luggage – only poor Lou and a few other travelers who took pity on me and helped heave the heaviest of the three suitcases from the platform into the railcar. Still, I managed to strain the muscles in my right shoulder, re-injuring myself each time I lifted it. I know what you’re thinking…and you’re right. I over-packed. My logic was this: I would be in France for the entire month of July. The first two weeks, Lou and I would tour much of the country and dine at several fine restaurants. For the second half of the trip, we would hook up with a group of friends from America to attend a wedding in Normandy. After that, we were to accompany our friends for a tour of the northern portion of the country. Dressy clothes were required for numerous functions, as well as the wedding ceremony. Because I would be on a tight schedule the entire trip, there would be little, if any time to stop to find a Laundromat. It was like packing for a land-bound cruise. Several types of shoes, from heels to walking shoes, were required, as well as a wide assortment of clothes to suit the variable weather (misty and cool one day, sunny and hot the next) – layers ranging from tank tops to a warm coat. So, I wound up using my biggest suitcase, plus a small one for the airplane, and another with wheels which carried my computer, books, papers, maps, and assorted necessities. Porters aren’t always available in French train stations, so when I saw one standing on the platform in Rouen, he was a welcomed sight. My rescuer wore a black uniform with a white name plate and shiny gold badge with an insignia that made him “official.” Spotting me at the railcar’s door, he zipped over and helped offload. Lou, on the other hand, effortlessly lowered her bags onto the platform, once again poking fun at my “big bag from hell” that took up most of the dolly. The porter, a short, dark-haired young man with a Greek name, placed Lou’s suitcases on top of mine. With the heavy load stacked clear up to his nose, he pushed the dolly from the platform into the crowded train station, as Lou and I trailed behind. Negotiating the mighty pile through the hustle bustle of Rouen Station, he approached the escalator leading to the upper or main floor. “Where’s the elevator?” I asked in French. “There is have no need,” he responded, rolling his load onto the moving steps. Glancing at Lou, I shrugged and stepped on the escalator behind the porter. She followed. As we neared the top, several pieces of luggage shifted to the left. The young man would have needed a third hand to reposition the cockeyed, ill-balanced load, as it teetered on the moving metal step. At the exact moment he reached the top, one of Lou’s black bags toppled off. When he reached to catch it, the rest of the luggage went this way and that, a jumble of baggage completely blocking the escalator’s exit. With no place to go, I stumbled, falling on my navy blue suitcase. Lou followed, landing on another bag. Each person behind her was literally thrust forward by the momentum of the moving stairs, and as they were slammed into by the person behind them, then the next, and next, like a stack of dominos. People tripped and fell, one on top of the other. Meanwhile, I had climbed over the bags, helping my desperate and heroic Greek porter push the bags out of the way. Seeing the beginning of a terrible disaster in the making, other people scrambled to our aid. Before it was over, a woman standing about four steps from the top stumbled backwards, landing on the man several steps below her. Thank God he was able to stop her fall, or things could have been much worse. No one was badly hurt, though I heard more than one French curse word uttered by some of the victims, as they picked themselves up and walked away. Embarrassed by his careless mistake, the porter rearranged the baggage and raced out the front doors to the taxi stand. He didn’t wait for a tip, didn’t make eye contact, and quickly disappeared back into the station. Likely, some of the half-dozen or so who had ended up tangled in our luggage reported the incident to French railroad authorities. We didn’t wait around to find out. Was it my big bag’s fault? Likely not. The porter should have taken the elevator. Nonetheless, I felt twinges of guilt. 1. Buy a lightweight suitcase that isn’t more than about 26” high. It’s worth the extra cost. 2. Always pack light. Rather than hauling half of your wardrobe with you, it’s better to budget out a couple of hours each week to do laundry. Not only did I strain my right arm and shoulder from pulling and lifting the big bag, I also hurt my low back. The money I could have saved in visits to the chiropractor would have easily paid for a new suitcase (like Lou’s). 3. Insist that porters use elevators instead of escalators! 4. Travel with friends with a good sense of humor and lots of patience (like my friend, Lou). For more information Colleen recommends One Bag: The Art and Science of Travelling Light.